January 4 1909 -- Hoo-boy, Jim Jeffries is starting to listen to the crazy idea that he should fighht Jack Johnson. Jim, you're old and flabby and you're going to look mighty silly if you do! 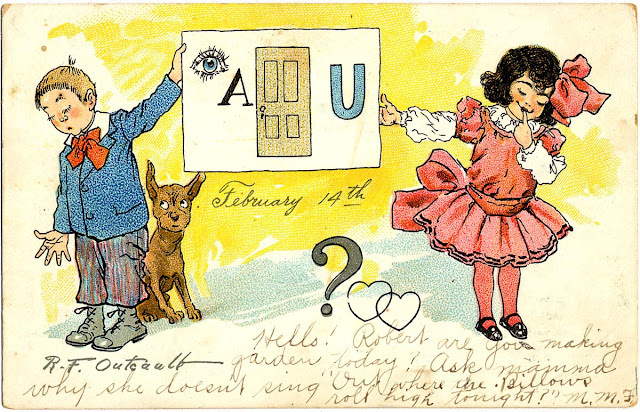 Here's a Tuck Series 106 Valentine rebus postcard (undivided back) featuring art supposedly by our good Mr. Outcault. Well, Mary Jane might be Outcault, but that boy and dog I'm guessing are tracings. What I do really like is the delightfully enigmatic message from M.M.F. Much harder to divine the real meaning of that than the rebus. I found the sheet music for "Out Where the Billows Roll High", words by J. T. Branen ; music by H. W. Petrie, but it must be some private "family joke". It's one of those songs about sailors and their lovers parting, perhaps to meet again only in the next world. Edward A. “Ed” Kudlaty was born in Cleveland, Ohio, on November 21, 1916. His birthplace is based on the census and birth date is from the Social Security Death Index. In the 1920 U.S. Federal Census, Kudlaty was the last of eight children born to Michael and Anna, both emigrants from Galicia, Austria. His father was a laborer at a furnace. The family resided in Cleveland at 1603 Branch Avenue. The 1930 census recorded the Kudlatys in Cleveland at 4219 Woburn Avenue. 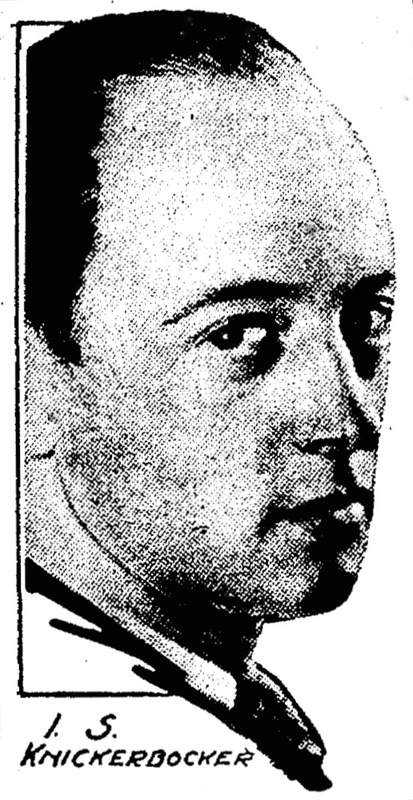 An indication of Kudlaty’s talent was mentioned in the Cleveland Plain Dealer (Ohio), June 2, 1936. Announcement was made yesterday by Henry Hunt Clark, director, of the result of the annual competitive examination in the senior classes of public and parochial high schools of Cleveland and nearby cities for scholarships in the Cleveland School of Art. Honorable mentions were given to: …Edward Kudlaty, 4219 Woburn Avenue S.W…. Ninety students entered the contest. Their work was judged by Clark, Otto F. Ege, head of the teacher training department; Alfred Mewett, registrar, and Alfred Howell, supervisor of art; Cleveland Board of Education. The same address was in the 1940 census which said Kudlaty completed four years of high school. His occupation was laborer at a brass factory. Kudlaty enlisted in the army April 1, 1941. Details of his service are not known. Kudlaty was discharged September 18, 1945. After the war, Kudlaty furthered his art training. The Cleveland Plain Dealer, June 3, 1947, reported the graduation of the School of Art. Students in the largest graduating class in history of the Cleveland School of Art will receive diplomas this afternoon in the auditorium of the Museum of Art, beginning at 3:30. …Nothing has been left out of the essential training of art students, as is apparent by the long list of graduates with the subjects in which each of them majored, and there remains a familiar ring in such titles as design, illustration and design, teacher training, advertising art, industrial design, handicrafts, sculpture, mural painting, and painting. The Cuyahoga County, Ohio, Marriage Records and Indexes, at Ancestry.com, said Kudlaty married between 1946 and 1948. Cleveland city directories in 1950s listed artist Kudlaty and his wife, Veronica, at 10614 Snow Road. The same address was in telephone directories in the 1990s into 2002. The date of Kudlaty’s employment with the Newspaper Enterprises Association (NEA) is not known. American Newspaper Comics (2012) said Kudlaty drew the Story of Old Glory from June 9 to 14, 1952. It was written by Jay Heavlin. His next NEA series was Generals Who Became President which was written by Ray Ellis. 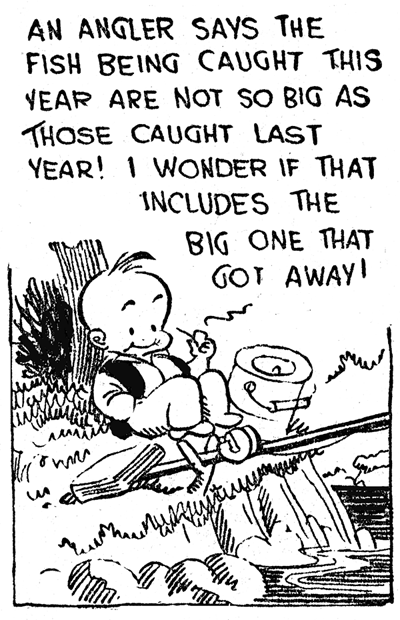 Their strip ran from January 12 to 19, 1953. Kudlaty and writer Russ Winterbotham produced the Kit Carson strip from October 12 to November 8, 1955. 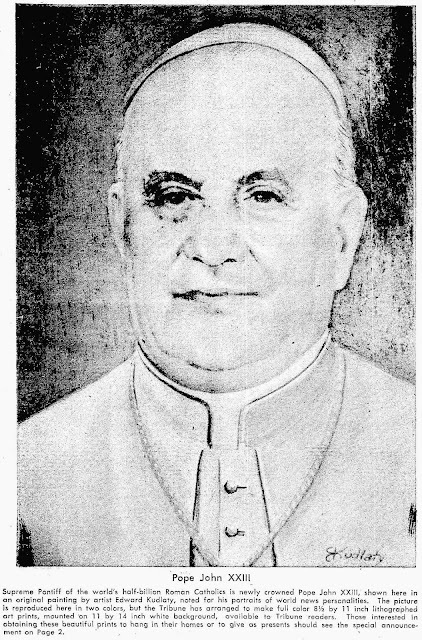 Kudlaty covered the 1954 trial of Dr. Samuel Sheppard. Photographs of his NEA courtroom drawings are at the Library of Congress. 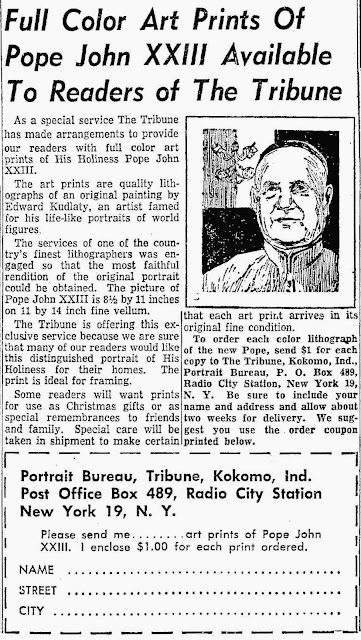 Kudlaty’s portrait of Pope John XXIII was published in many newspapers including The Kokomo Tribune (Indiana), November 4, 1958. The portrait was also available for purchase. The Gadsden Times (Alabama), April 19, 1962, published Kudlaty’s Easter drawing. During the 1964 presidential election, Kudlaty drew Conventions and Crisis which featured first, the Republicans, followed by the Democrats. In 1973, Don Oakley and Kudlaty produced the 12-part A Splendid Little War. The next year, Kudlaty drew the six-part Gerald Ford: The Man from Michigan. 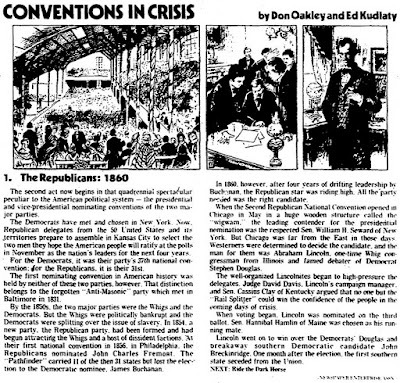 For the 1976 presidential election, Kudlaty drew Conventions in Crisis which reused some of his art from the 1964 series, Conventions and Crisis. Kudlaty’s wife, Veronica, passed away July 15, 1996. Eleven years later, Kudlaty passed away December 13, 2007, in Cleveland. Accordng to the death certificate, Kudlaty was an NEA artist who had a bachelor’s degree. 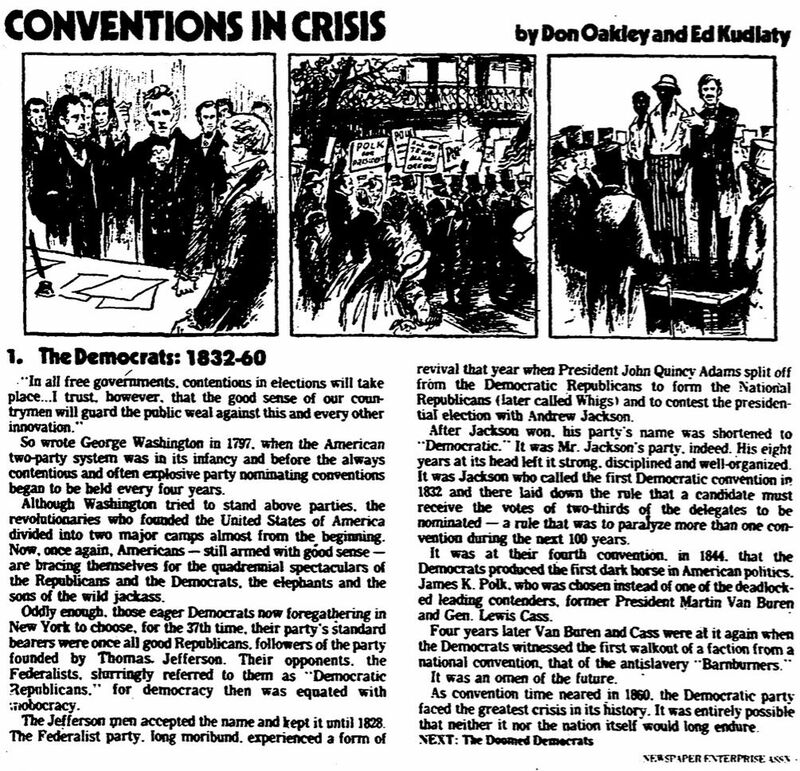 NEA's practice of offering short-run comic strips about factual subjects usually tied the subject to current events or an anniversary. Kit Carson, offered by the syndicate in a 24-part series, seems to have been issued as a corrective to the popular 1950s Adventures of Kit Carson television series, which portrayed the historical figure with not even a nodding acquaintance to the fellow's actual life story. The story, penned by Russ Winterbotham, made an attempt to be more factual, but this was still the 1950s, and Carson, who would later be reconsidered by historians as a ruthless killer of Native Americans, was given an unabashed hero treatment. Ed Kudlaty, an NEA bullpenner, provided slick art for the series. As was often the case with NEA's closed-end series, running dates are all over the map. The earliest I've encountered the strip starting is October 3 1955, but the intended start date was October 12, which places it starting the next day after the conclusion of another NEA closed-end series, Daniel Boone. 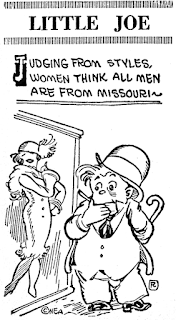 Kit Carson is quite unusual for an NEA closed-end strip, since it actually carried running dates. The strip reached its conclusion on November 8 of that year. where one closed-end series began right after another ended? When I indexed the NEA Archives at OSU many moons ago, I could see no rhyme or reason to when these closed-end series were released. I didn't realize until later that many of the NEA closed-end series had not been archived, so naturally I would not have seen a regular schedule of any kind, even if there was one. Therefore, it may be that they were issued on a standardized schedule, but I'd have to have more perfect knowledge of what NEA issued and when. The question is made more complex by the fact that I did not, and do not, consider all the series to be qualified as comic strips. 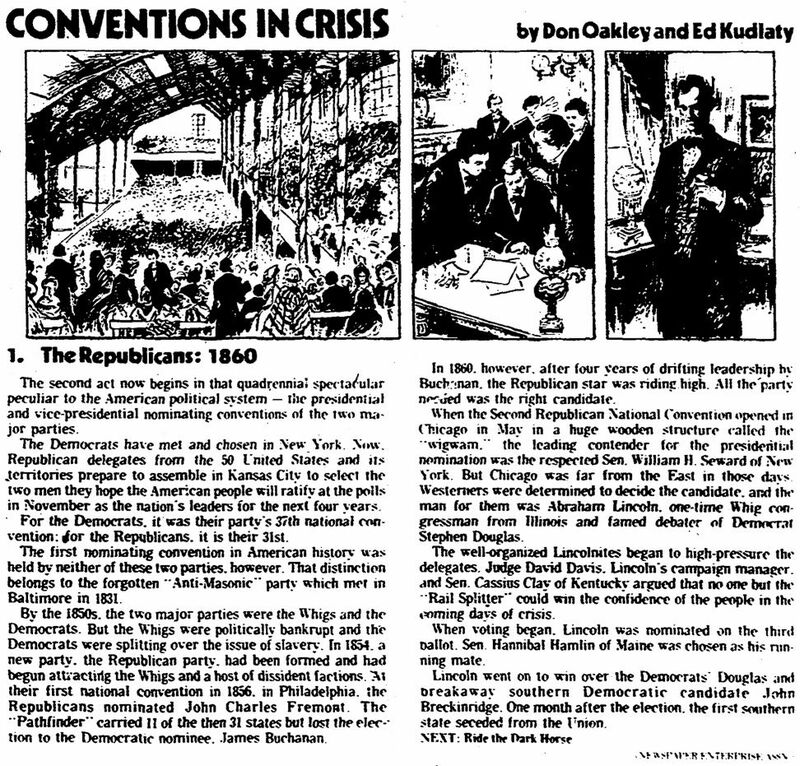 For instance, you'll see in Alex Jay's profile of Kudlaty that he shows examples of "Conventions in Crisis". This series is so over the top text heavy that I could not in good conscience index it as a comic strip. There are quite a few other examples of series that I felt did not qualify. Thus I do not have an exhaustive list of these closed-end series even now from which to glean a schedule. Irving S. Knickerbocker was born in Auburn, Washington, in January 1898. The birthplace was mentioned the Cleveland Plain Dealer, January 27, 1930. The birth date was recorded in the 1900 U.S. Federal Census which said Knickerbocker was the youngest of two children born to Irving, a lawyer, and Olivia. The family resided in Auburn on Silver Street. The Knickerbocker branch of a family tree can be seen here. The 1910 census said Knickerbocker had two more siblings, and his maternal grandmother was part of the household. Auburn was still their home. The Plain Dealer wrote about Knickerbocker’s activities in this decade. He started out to find adventure when a youth and worked on a farm in New York state, was a saw flier in a lumber camp, worked on a railroad and did many things. He served with the medical corps in France in the World War. The War Department O.Q.M.G. Form 623, Application for Headstone, recorded Knickerbocker’s military service. He was a sergeant in Signal Corps, #116, Field Signal Battalion, 41st Division in Washington. According to the 1920 census, Knickerbocker, unemployed, and two younger siblings lived with their parents in Auburn at 700 West Second. In the mid-1920s, Knickerbocker moved to Cleveland, Ohio. Cleveland city directories listed him at 2019 Brown Road, in 1926, and 1351 West 76th, in 1929. Knickerbocker worked for the Newspaper Enterprise Association (NEA). He signed his work “Knick”. American Newspaper Comics (2012) said Knickerbocker created and worked on several projects for the NEA. Knickerbocker was the second of six artists on the weekly strip, Bugs, which started on March 12, 1924. Following Roy Grove, Knickerbocker’s run was from November 11 1925 to April 7, 1926. He was followed by Charles D. Small, George “Swan” Swanson, Arthur Sefcik and Don Wootton. Little Joe Says was started by Storm, who was followed by Larry Redner. Next was Knickerbocker who worked on it in 1926 to March 7, 1930. Knickerbocker’s The Papers Say started April 21, 1926 and ended January 13, 1927. The Tinymites was written by Hal Cochran and debuted October 8, 1926 with artist Larry Redner. Knickerbocker took over from January 10, 1927 to February 18, 1930. He was followed by Joe King and George Scarbo. The art on Ad Fables (1928) resembles Knickerbocker’s style. Knickerbocker drew J. Disraeli (Dizzy) Dugan (aka Dizzy Dugan), which was the Sunday topper to Salesman Sam, from October 9, 1927 to March 23, 1930. Mac (aka The McCoys) was created by Knickerbocker who produced it from May 10, 1929 to March 7, 1930. It was continued by Munch, Howard Boughner and Bob Moyer. The Morning Star added the following about Knickerbocker’s death. Two coincidences, striking in the light of the tragedy that befell him, marked his last day of life. Knickerbocker was laid to rest at Mountain View Cemetery in Auburn, Washington. There seemed to be an almost insatiable appetite in the 1920s newspaper offices for little one-column panel cartoons, and the syndicates were only too happy to oblige. Most of the little one-column jobs were of the 'pithy sayings' variety, whether voiced by flappers, Asians, mammies, or most any other stereotype you can think of. Perhaps a character that wouldn't immediately come to mind is Little Joe, a weird cross of portly middle-aged man and baby that is as creepy as they come. 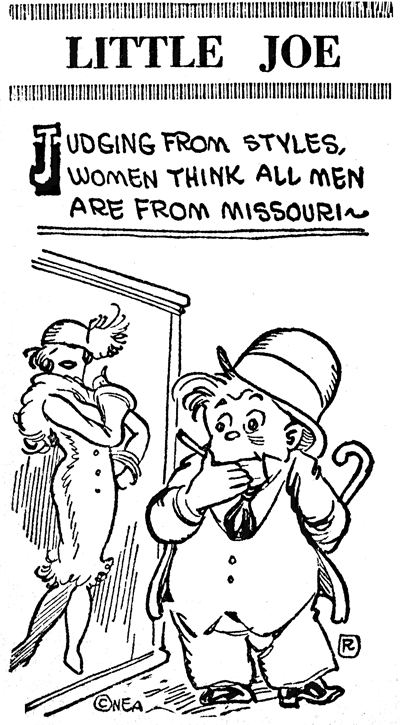 While the sayings were sufficiently pithy, the drawings of the man-baby could be downright disturbing. It's his little tiny feet that were often depicted that really set the hair on the back of my neck a-tingling. 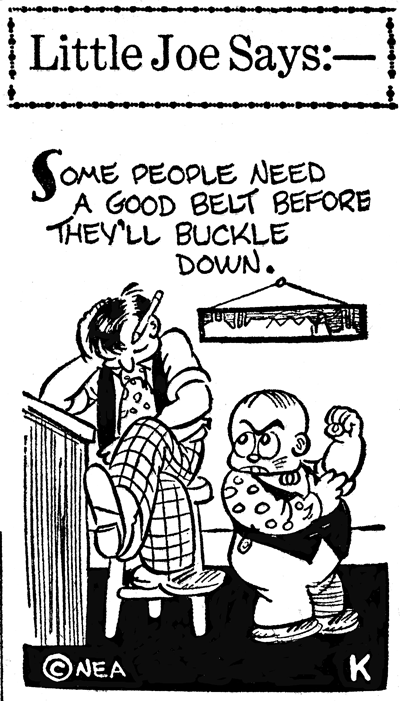 Little Joe Says was an NEA daily offering that debuted on February 21 1924. The first five days of panels were untitled (by mistake?) so Little Joe didn't actually get his moniker until February 27. Although the panel was seldom signed, it did happen enough that we can track credits. The first artist to work on the feature was 'Storm', whose signature appeared rarely from February to November 1924. Thing about this 'Storm' fellow is that his art looks just exactly like that of the next artist, Larry Redner. My guess is that 'Storm' is just a pseudonym. Redner stayed on the daily feature until June 19 1926, when he stepped aside to give Charles D. Small a whack at it. Small didn't last too long, because he was taking over Salesman Sam at this time, and his last work appeared on February 5 1927. 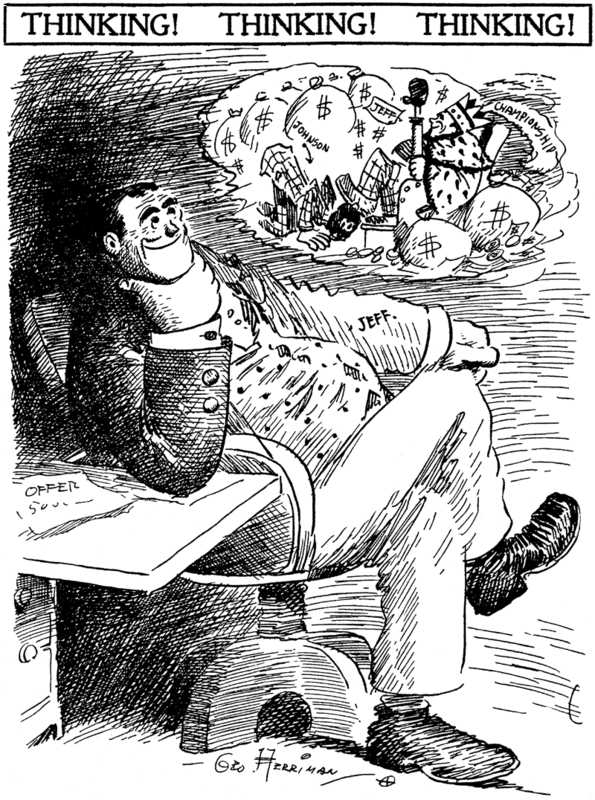 Irving Knickerbocker became the final artist on Little Joe Says, and his tenure was the longest. The weird man-baby was put to bed permanently on March 7 1930. Would papers run these every day, or use them as column pluggers? I worked at a newspaper in the days just after cold type replaced linotype, but before pagination. The guys in Composing pasted up pages using layouts sent from the Copy Desk. PR produced scores of strange little filler ads so Composing always had something at hand when an article or an ad didn't fill the allotted space, and it was too late for the Copy Desk to provide a short item to fit. I never saw cartoons used as filler -- they only ran as scheduled features. Some papers ran these little guys as standard daily features, but others definitely ran them ROP. Yet others seemed to have a standard daily spot assigned for them, on the editorial page say, but if something else ran long, they got the boot.